Rather than giving in to the commercialism of Easter and buying everything from the supermarket, encourage your kids to make their own Easter cards this year. 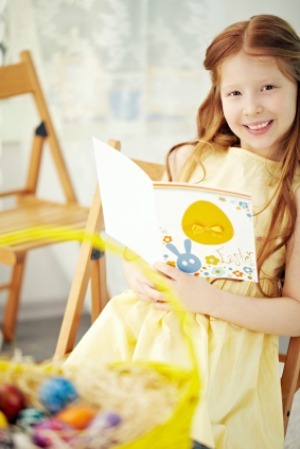 Have a lot of fun spending time with your kids and surprise their teachers, family and friends with these cute hand-made Easter card ideas. You could even tie them to a small organza or brown paper bag with a few quality mini eggs popped inside. Despite how hard you try to educate your kids about everything else that Easter involves, one of the first things they’ll probably think of is… chocolate eggs! (And who can blame them, really!) Kids of all ages will love making these cards by flexing their creative muscles and decorating their eggs however they like. Stars, stripes, glitter, polka dots — they’re only limited by their imaginations! Any materials they might like to decorate with, such as ribbons, lace, petals, leaves, glitter, fabric, etc. Cut a piece of card and fold it in half. Decide which side is the front and draw an egg shape on it. Your child may need some help or may even decide to trace around a cookie cutter or oval-shaped object to get the shape perfect. They can now decorate their egg however they like, whether it be with a drawing, painting or collage. For collage eggs, fill the inside of the egg outline in glue and let your child stick whatever materials they like on top. For a tricky twist, give them pieces of clean, broken eggshells to glue inside their egg shape; they can then colour over or decorate the shells with felt-tip pens. Don’t forget to write a greeting inside the card! And the next best thing after chocolate eggs? That’s right, the Easter bunny! Your children will love making a cotton wool collage of the bunny’s smiling face on this cut-out card. Run some glue over the bunny’s face and let your child decorate the fluffy face with cotton wool buds. You can also add embellishments like pink tissue paper for the inner ears and buttons for the eyes. Turn over. Your child can now write a message on the back of the card.